The Biorefinery Technology Scale-Up Centre (BTSC), located on the Grand Falls site of the Collège communautaire du Nouveau-Brunswick’s (CCNB) Edmundston campus, supports industry in its bioproduct promotion efforts. The centre’s activities focus on two branches of fermentation technology and chemical analysis. The first sees the BTSC team working with fermentation and other bioprocesses for industrial-grade products like biogas, ethanol or other high-value molecules. The second is dedicated to alcoholic beverages and the value chain surrounding them. 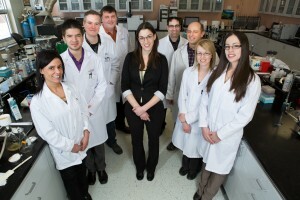 The centre launched in 2010 with a grant from the Natural Sciences and Engineering Research Council of Canada (NSERC). Additional special equipment financing was provided by ACOA and the Province of New Brunswick. Josée Landry manages both the BTSC and the Eastern Canada Soil and Water Conservation Centre (ECSWCC), the latter focusing on agro-environmental sciences. Landry, an Edmundston native, completed her Bachelor of Science Degree in Microbiology and Master’s in Plant Biology at Université Laval. She spent her initial post-graduate years working for her alma mater as a researcher. In 2012, the opportunity to lead the BTSC presented itself. Opportunities NB (ONB) spoke with Josée Landry to learn how the BTSC supports Atlantic Canada’s bioscience industry, and about her move back to New Brunswick. ONB: During our recent chat with Mycodev Group David Brown mentioned the collaboration his company has had with the BTSC. It sounds like private industry can essentially test their products at the centre. Is that correct? Landry: Yes. One of the centre’s specialties is right there in the name; scale-up. With Mycodev, David and Brennan had an idea they knew could work, but that still required validation. In his case we started in the lab at a low volume, then scaled-up the process from there. We’d move from a few millilitres to a litre, to four litres, to forty, and so on. David was always heavily involved in our lab working alongside our technicians and researchers. The goal is to bring a technology as close as possible to commercialization so the company sees their risk reduced before going to market. We have big projects with long-term relationships like Mycodev, and we have smaller projects where clients need help with one aspect of a technology; sometimes it’s just ironing out a glitch. It can involve us doing the bulk of the work and getting a client their answer from there, or it can involve the client being here in the lab with us taking the lead. We are very flexible about that. ONB: Beyond Mycodev are there other notable clients you can single out? Landry: L’Érablière Denis Côté is another one of our long-term partnerships. One of their available products that we’ve worked on is the Davia Sap Water. We also work with Laforge Bioenvironmental, they work in the biogas sector. That work is mostly analysis-based, for example when they have a new biomass we test it before it goes into their anaerobic digester. This is to ensure that the biomass is worth using, and that it won’t crash the system. ONB: What sets the BTSC apart from other similar research centres? Landry: We do not do any basic research here; our focus is entirely on applied research. All we do here is answer the industry’s challenges. We do not bring projects to industry; it’s really them coming to us with ideas and challenges. Our staff works on research projects full time; they have no teaching duties so our turnaround time is quick. We are able to put full focus on projects without having to split time in the classroom. But, most importantly, we have an awesome team of talented, hard working scientists. ONB: Does this mean CCNB students do not take courses around BTSC areas of focus? Landry: Not at the Grand Falls site where the BTSC is located. At the academic level it all happens in Edmundston. Students do get involved indirectly with our projects, however. They can do four month internships here and get actively involved in the work; we typically take on four or five intern students per year. We also get involved in curriculum development as much as possible. While we don’t teach full time we can and do send staff to teach some courses, or students come to Grand Falls for specific subjects, like using High-performance liquid chromatography (HPLC) as an example. CCNB instructors can also come here to work on projects. So there is quite a bit of interaction with the academic side of the College. ONB: We love talking to people that have returned to New Brunswick for career opportunities. Were you actively looking for a chance to come back? Landry: Yes, my husband and I were absolutely looking for an excuse to return home. I was on maternity leave with our first child, and decided to come to New Brunswick to look for work. Had I not found anything I would have returned to Québec, but after about six months the BTSC opportunity presented itself. We jumped at the chance to return to the province. We aren’t alone either; our chemist is originally from here as well. He was working in Halifax when the BTSC recruited him and also took this opportunity to return here with his wife. This has been a great opportunity for all of us. ONB: Compare doing business in New Brunswick to your past work experiences. Landry: If you’re stuck on something you can call any number of locals and they can help, because if they don’t have the answer they know someone who does. It’s a tightly-knit community and experts and decision makers are highly-accessible as a result. Compared to larger centres like Québec it’s easier to get face time with important people. In terms of work-life balance, we have never had to worry about things like finding a good daycare, because here you’re not on a wait list for years. There’s so much open space here, and if you are an outdoorsy there is plenty to do. We have found land to be reasonably priced here as well, and that’s big. It’s a great place to raise a family. ONB: Let’s talk about the province’s bioscience authority,BioNB. What role does that organization play with yours? Landry: We have a strong working relationship with BioNB, much of that involves co-organizing things like conferences and workshops. They also refer industry clients to us and vice versa. They are easy to work with and serve as a great advocate for the bioscience industry in New Brunswick. ONB: We should probably take a moment then to plug the upcoming Atlantic Biorefinery Conference. Tell us about that. Landry: The conference is organized by BioNB, the BTSC, andSpringboard Atlantic. It’s in its fifth year now and this year’s event is in Halifax. The dates are May 30th through to June 1st. The conference involves a technology tour where we bring attendees around the area to visit with industry. It’s a great opportunity to speak with industry professionals and see exactly what they’re working on. This year we check in with Ketch Harbour Marine Research Station and the Innovacorp Demonstration Centre. The next two days involve numerous speaker sessions and networking events. We even provide a business-to-business room where attendees can do ‘speed dating’ style face-to-face chats with researchers or other industry players. ONB would like to thank Josée Landry for her time. Be sure to visit http://www.atlanticbiorefineryconference.ca to learn more about this year’s Biorefinery Conference (May 30th to June 1st).